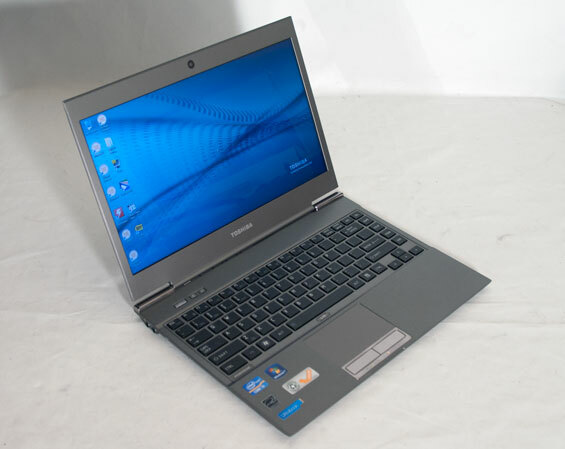 Introducing the Toshiba Portege Z835 The Toshiba Portege Z835 is No Sliver Queen Application and Futuremark Performance Battery Life, Heat, and Noise Unfortunately the Display is Dire Conclusion: But Who is This For? Intel's Ultrabook initiative is a curious one, one that's very gradually picking up interest among vendors. We've already had a chance to take a look at the smaller of the two units from the typically early-out-of-the-gate ASUS, and we know there are other ultrabooks out there from Lenovo and Acer, with only Dell opting to sit out of this round, unconvinced of the viability of Intel's plan. Today, in true Toshiba fashion, we get a chance to look at a more budget-oriented (or at least as budget-oriented as an ultrabook can be) unit: Toshiba's entry-level Portege Z835-P330. Honestly the impressions start before it even gets out of the box, just because the box itself is so unusually small that you wonder how it could possibly hold a computer. But sure enough, once you open it up you'll see Toshiba's sliver of a notebook. Even if you're used to the MacBook Air, getting an ultrabook in your hands is an interesting experience. It barely weighs anything, and the profile is slim to be sure. It's a testament to how technology has evolved that a notebook like this is even possible, but there were definitely sacrifices made. Starting at the top of the Toshiba Portege Z830, we have arguably its weakest link: the Intel Core i3-2367M. This processor may be Sandy Bridge hardware, but the anemic 1.4GHz clock speed on the two cores is pretty brutal, and the lack of Turbo Boost (a feature reserved for i5 and i7 processors) only exacerbates things. For basic netbook-style tasks it should still be perfectly fine, but I'll say it right now: anyone interested in the Portege Z830 would do well to wait and upgrade to an i5-equipped unit at least. Toshiba includes 2GB of DDR3 soldered to the motherboard as well as an expandable 2GB of DDR3-1333. The problem is the Portege Z830 is difficult to get inside of without feeling like you're going to damage it, but on the flipside a cumulative 4GB of DDR3 should be more than adequate for the tasks this notebook is intended for, and this model will likely be throttled by CPU performance long before that memory becomes an issue. As part of Intel's ultrabook initiative, Toshiba includes a generous 128GB mSATA SSD. Unfortunately, it's not a particularly fast one, rated for just a peak 180MB/sec on reads and 70MB/sec on writes, and using Toshiba's own controller and MLC NAND. So if you were concerned about that 3Gbps interface, rest assured this drive will never saturate it. On the flipside, 128GB of flash (even a comparatively slow SSD) is still a big improvement on a mechanical drive of the same capacity, and the Portege Z830 definitely feels snappier for it. The one place ultrabooks seem to be succeeding where Apple keeps dropping the ball is connectivity. Apple's willing to sacrifice connectivity by tapering the MacBook Air, making the notebook look slimmer than it really is as a result of the wedge shape. Meanwhile, Toshiba outfits the Z830 with a pair of USB 2.0 ports, a single USB 3.0 port, headphone and microphone jacks, and HDMI and VGA output; Toshiba even keeps a dedicated Ethernet port in the mix. Thunderbolt may have potential, but USB 3.0 is here right now, and it's a lot cheaper to boot. The Toshiba Portege Z835 is No Sliver Queen Introducing the Toshiba Portege Z835 The Toshiba Portege Z835 is No Sliver Queen Application and Futuremark Performance Battery Life, Heat, and Noise Unfortunately the Display is Dire Conclusion: But Who is This For? Why are all ultrabook makers idiots? While I don't like the stickers either....Toshiba most likely gets discounts for adding those stickers. I'm Certain INTEL marketing department would have a problem if the stickers were not displayed. Intel is ALL about marketing its brand and does a very good job of it. Any low-tech consumer is dazzled by these stickers and assume the system is a good purchase. General consumers are mostly dumb and buy primarily on visual information instead of factual research. How else could Apple charge the prices it does for its computers and its crazy upgrade prices. If consumers checked how much 8 gigs of memory cost on NewEgg (40.00) ...they'd tell Apple to go screw themselves and then purchase the memory to install themselves. General consumers are typically lazy....they are PROGRAMMED to want things NOW and screw the cost or lack of real features. I don't think Toshiba is marketing to AnandTech users. I believe they are marketing to Apple fashionistias, Because their price point is less than Apple and they are most likely targeting those buyers who want something like an Apple airbook, but for less and with windows OS. Most of those users only check email and FaceBook. "Regarding stickers......Simple solution is to remove the stickers after your purchase." They don't make it easy, but it's not impossible if it really bothers you. I know the GOOP adhesive remover is really good for getting the adhesive off once you remove the sticker. I've heard that cooking oil as well as well. I'd think twice before using anything that containes a chemical, but you can try WD-40 (suggested by Ushio01) at your own risk. You may want to try using a straight razor blade on the edge of the sticker to start the lifting process. Fingernails are just not thin enough. Patience is the key to accomplishing the removal without scaring your product. Goo-gone is available at the "dollar tree" store locally. The hardware store has much larger bottles for under $4. There is also a felt tip pen version, which would probably be perfect for the laptop stickers.